ALBANY, NY – With spring – and soon summer – on its way, that means it’s time once again to enjoy New York State’s historic gem the Erie Canal. 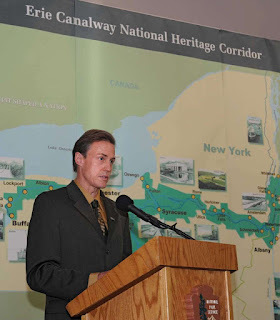 Bob Radliff, the executive director of the Erie Canalway National Heritage Corridor, will speak on Wednesday, April 11 at the Albany Roundtable about the historic preservation and future of the Erie Canal. Spearheaded by Erie Canalway, 450 miles of the New York State Canal System was designated as a National Historic Landmark district in 2016. The National Historic Landmarks Program recognizes historic properties of exceptional value to the nation and promotes the preservation efforts of federal, state and local agencies and Native American tribes, as well as those of private organizations and individuals. Radliff has been the head of the Erie Canalway since 2013. Prior to that, he served for 17 years as the Executive Director of the Community Loan Fund of the Capital Region, a nonprofit financial institution capitalized by socially concerned investors. From 2010-2013, he simultaneously served as the Executive Director of the Albany Center for Economic Success, a small business incubator and community development facility. From 1990-1995, he was the Executive Director of the Albany Community Land Trust, a nonprofit corporation holding land in trust while providing long-term access to meet community needs. The cost for the April luncheon is $20, which may be paid at the door. The Roundtable also offers its guests the option of paying in advance with a credit card at www.albanyroundtable.com. The University Club will serve a hot and cold buffet from 12:00 noon to 1:00 p.m., with the program commencing at 12:30. Reservations for the April 11 luncheon are required by Monday, April 9 and may be made by prepaying online, by calling and leaving a message to register at 518-992-5360, or by sending an e-mail to albanyroundtable@gmail.com. In May, the Albany Roundtable will welcome urban planner and educator Daniel D’Oca as Visiting Speaker to discuss “Race, Place, Power & Privilege.” He will describe techniques for making cities more equitable and inclusive at the Albany Roundtable’s Annual Meeting on Wednesday, May 23 at 6:00 p.m. at the Albany Institute of History & Art, 125 Washington Avenue. Tickets are $40 and include light fare and open bar.